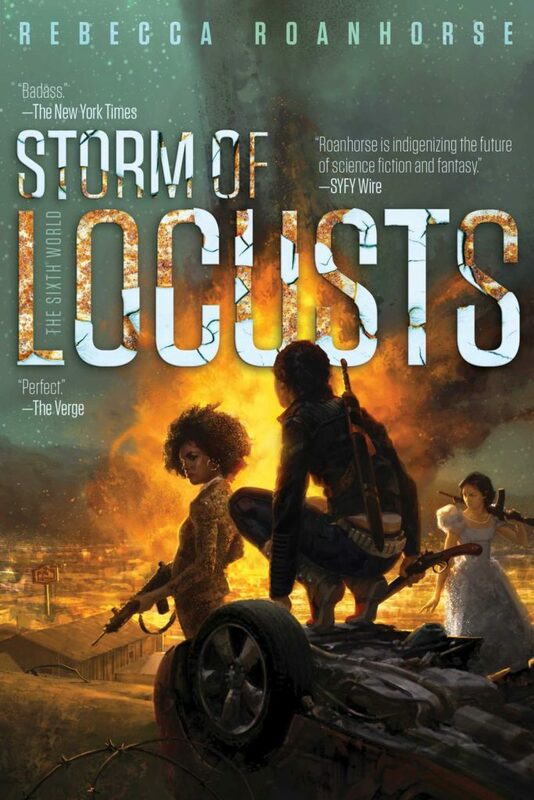 Having been swept away by Trail of Lightning by Rebecca Roanhorse, I knew I had to check out the sequel, Storm of Locusts. And I was not mistaken. The sequel is phenomenal and everything I could have wanted for the series. Storm of Locusts is a fabulous sequel to the powerful and action packed Trail of Lightning. The Sixth World is a series that I know I’ll be reading and re-reading in the future. There’s such a wealth of rich world building, fantasy elements, and character development. Maggie is as clever, sarcastic, and powerful as ever. And in Storm of Locusts she is joined by some other fabulous comrades – Ben (who’s bisexual) and Rissa. I have nothing but good things to say about Storm of Locusts and it’s amazing story lines. Roanhorse has a fantastic way of writing sequels that wrap up loose ends while still leaving us wanting more. Storm of Locusts picks up right after the first book and Maggie is still very much reeling from the events of the first book – not to mention her new sword. And a common theme within Storm of Locusts is that Maggie is trying not to kill people, to incapacitate people, and throughout the entire book Maggie shows so much character growth in the way she deals with the antagonist, all the way to her new allies. Even though she’s guarded, a little prickly, and carrying a giant sword, Maggie forms fierce loyalties. We witness her tenderness, vulnerabilities, doubts and fears. And at the end, we love Maggie for them. I could go on an on about Maggie, because, for me, Storm of Locusts was about Maggie’s growth. Maybe it’s because we already know who she is from Trail of Lightning, but this book solidified a place in my heart for Maggie – her strengths and weaknesses. Storm of Locusts seems to ask Maggie just what she is willing to do, to sacrifice for the people she loves, and what that might cost her. It’s full of witty conversations between Maggie and Rissa, tender conversations of loss between Maggie and Ben, and enough of a hook to start a countdown for book three. It’s a book about choice, consequences, situations, and what we can do with them. Find Storm of Locusts on Goodreads, Amazon, Indiebound & The Book Depository.